Remember those assignments back in grade school, you know, write an essa y recounting what you did this past summer? I never liked those, and quite frankly, I get tired of asking and being asked “How was your summer?” My stock answer is “It was too short,” and honestly, that’s true. I love summer, and the day I turn in my grades I head home, dig through my CDs, and crank Alice Cooper’s “School’s Out,” which since I heard it in the early 1970s is the herald of the glorious days of summer vacation!! I’m not going to recount my summer, for that would be quite dull and irrelevant. However, there are some things I did which are connected to Franklin Pierce University, and they led me to spend time mulling over specific topics and concerns I have about this university and my workplace. I like baseball (a lot), so like most summers I spent time this year at numerous ballparks. A few games at Fenway are traditional, as is an evening tailgating with family and seeing the Milwaukee Brewers at Miller Park out in Wisconsin. One of my sons even agreed to spend a few days traveling southward in July and braving the intense heat (over 100 degrees every day) and humidity to visit a couple of minor league ballparks. Fluor Field in Greenville, SC was our first stop, a replica of Fenway Park in regards to field dimensions. This makes sense, since it is the home field of the Greenville Drive, a Single-A affiliate of the Boston Red Sox. Across the street is a museum dedicated to Shoeless Joe Jackson, who hailed from Greenville, and the area around the ballpark and the downtown was brimming with energy. Lots of new restaurants, boutiques, galleries—a surprising oasis of urbanity in upstate South Carolina. Our second stop was Augusta, Georgia, and the home field of the Augusta Greenjackets, a Single-A affiliate of the San Francisco Giants. The ballpark is the only one I’ve ever seen with giant ceiling fans rotating slowly over those seated beneath the canopy covering some of the seats, but given the oppressive heat and humidity common to Augusta, I guess anything that keeps air moving is welcome. 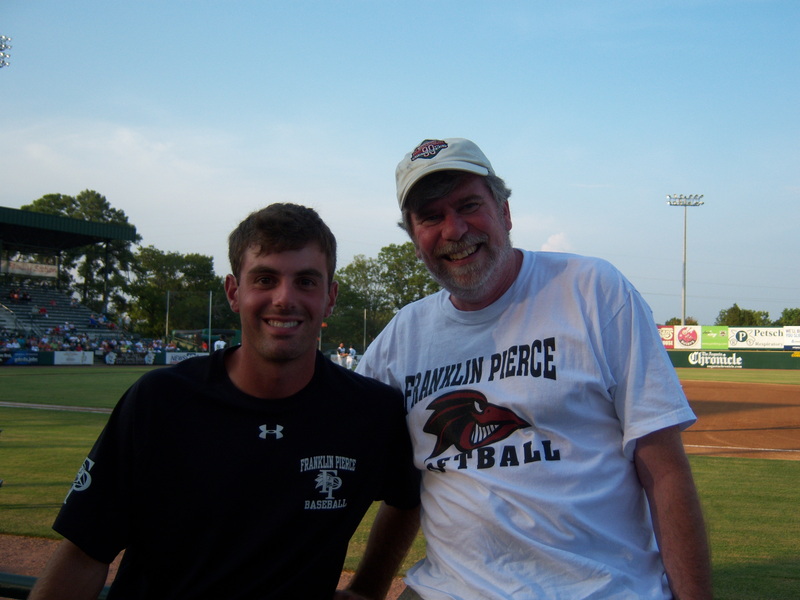 My objective was to meet Kyle Vazquez, who as an FPU junior signed in 2009 with the San Francisco Giants. Kyle had majored in History and I had served as his academic advisor at Franklin Pierce, so I thought it might be a nice surprise to drop in on a game. As it turned out, Kyle was injured but not yet reassigned, so we were able to meet at the ballpark and catch up on the past eighteen months of his baseball life. I haven’t heard from him since he went off to Arizona, but he certainly has my best wishes in his baseball career, and he knows that if he ever returns to finish his academic work, we will welcome him back without a moment’s hesitation. I note all this because of the topic I am about to broach. I enjoy sports, especially baseball and hockey, and I recognize and commend the good things the FPU teams often do in the community. BUT, I do have problems with how this University overemphasizes athletics, particularly the imbalance I see in the real relationship fostered here between athletics and academics. In fact, I think it is time to either recalibrate that relationship OR face realities and rename the institution. That modest proposal will be my next blog entry.